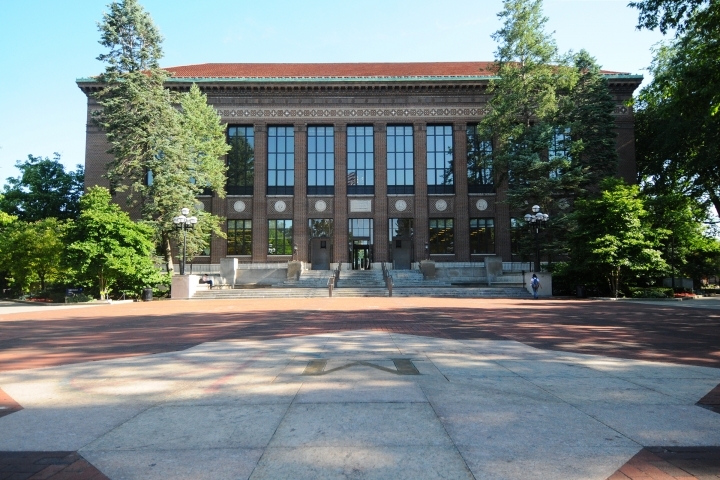 The Diag is the brick space including the "M" and the concrete benches at the foot of the steps of Hatcher Graduate Library. 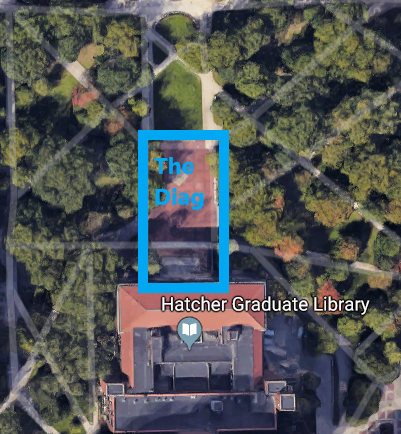 You might hear people refer to it as "The Diag Proper." All sidewalks, grassy areas, plazas, etc. in the surrounding area are coordinated by a different office, Facilities & Operations. Here is a link to the F&O space request form. 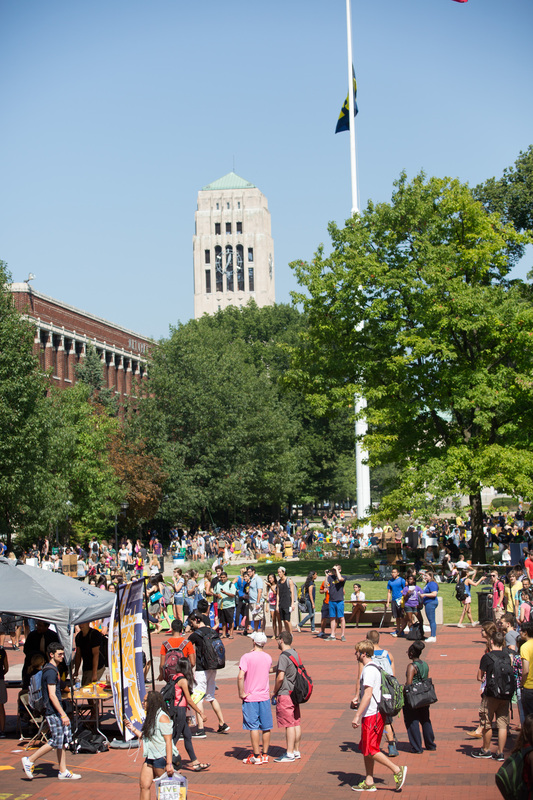 If you wish to have an event that includes both the Diag and the grassy areas and sidewalks, please submit both requests. 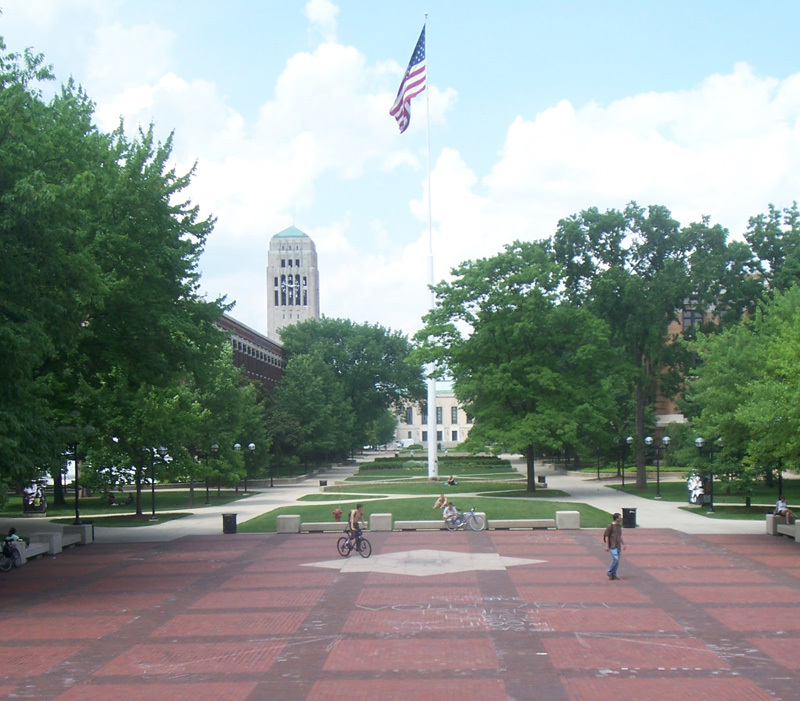 The Grove is the North Campus Diag. All sidewalks, grassy areas, plazas, etc. in the surrounding area are coordinated by a different office, Facilities & Operations. Here is a link to the F&O space request form. If you wish to have an event that includes both the Grove and the grassy areas and sidewalks, please submit both requests. The Diags are available on a first-come, first-served basis up to 12 months in advance. Students, staff and faculty may distribute pamphlets, flyers, etc., without obtaining a permit, as long as no equipment (i.e., tables, chairs, carts, boxes, or other objects) are placed on the property, and they do not interfere with other authorized activity on the Diags. Unauthorized or disruptive parties may result in intervention from the Department of Public Safety. Only recognized student organizations and university departments with valid University accounts (i.e. shortcodes) are eligible to reserve the Diags. All events on the Diags must be open to all and be free of charge. No sales of any sort are allowed. All individuals interested in reserving the Diag spaces must submit the Diag Reservation Application. Applicants must be Authorized Signers of a recognized student organization and/or be affiliated with a University department. A University Shortcode will be required for all organizations in the request. Although the Diag is free of charge, this will be used in case of damages or other approved charges. If you are requesting Electricity, Amplification or any other Diag Services, the estimated fees will be communicated to you prior to the event. At that point there will be a ‘hold’ placed on your SOAS funds until the actual charges are processed after the event. If you are in need of a receipt, please request one with the application. The Central Campus Diag Calendar -OR- North Campus Gerstacker Grove Calendar can be helpful when reserving/planning events. DO NOT assume your event has been approved until you receive a confirmation in writing. Have you reflected on how the event logistics impact the campus? How do you expect the event content to impact the campus? How will you foster conversations that encourage learning and connections? Have you thought about ways to de-escalate conversations? What is your plan to support your organization members sharing content that can often be draining? The Center for Campus Involvement will be a resource to you throughout your event. However, if you are looking for support for events we hope you find the following resources valuable. Only recognized student organizations and university departments with valid University accounts (i.e. shortcodes) are eligible to reserve the Diags. The Center for Campus Involvement does not share the name of organizations reserving the space. You may not use stakes of any kind on the Diag or grassy areas (For acceptable structure and equipment dimensions see the Outdoor Common Areas policy). No motorized vehicles may be driven on the Diag or sidewalks leading up to the Diag. Time limits – 8:00am to 10:00pm. Events outside of this time have the option to apply for a waiver. Time exemptions will be made with consultation of Campus Police and Facilities and Operations to ensure safety. "University Days" are days are days in which the Diag cannot be reserved (no exceptions). This includes study days, exams, and graduation. More information here (opens in new window). Sales and solicitations are strictly prohibited on the Diag. All inflatables must be under 8 feet in height and must be keep clear from any trees, benches or other stationary objects on Diag property. Open flames are not permitted on the Diag at any time. This includes candles, grills, etc. You must print and carry a copy of your permit the day of your event. Chalking with water soluble chalk is allowed on University sidewalks and plazas. Chalking is prohibited on other University property including, but not limited to, buildings, columns, seating, walls, steps, and other surfaces, structures and fixtures. The University has no responsibility for maintaining or removing chalk placed on sidewalks or plazas. Aerosol spray chalk is not acceptable on any surfaces. Food on the Diag is allowable with advance planning. The more complex the food, the more advance planning is needed. Food Guidelines for Diag and Grove. All food serving must meet Environment, Health, & Safety (EHS) standards for approval. Consult OSEH at 734-647-1142 prior to planning to bring food not listed on the above Google doc. No sales of food, including "suggested donations," are permitted on the Diag. Approved events are required to keep the immediate area free from litter and to remove all of their materials from the area upon completion of use. Trees, grass, and shrubs shall not be altered, damaged, or destroyed. If your event will generate more trash than the existing containers will accommodate, it may be necessary to get assistance from Grounds & Waste Management. There is a cost associated with this. If your organization is interested in deploying any form of inflatable structure or rental item, it may not exceed the 8 foot height restriction or be larger than 10’ x 10’ (footprint). All items must be kept clear from any trees, benches or other stationary objects on Diag property. In addition, a Certificate of Insurance from the rental company MUST be submitted to diag.info@umich.edu. Inflatable games must be attended by volunteers from the hosting organization at all times. Hammocks: because hammock strings are harmful to the trees, this is not permitted in the grassy areas around the Diag. It is not safe to hang hammocks from light poles (this is also not permitted). Amplified sound is considered any source of amplification from an electrical source such as laptops, megaphones, large speakers, etc. Acoustic instruments are not considered amplified sound. The allotted 12:00PM-1:00PM time has been reserved for events that require amplification. Monday to Friday: 5PM and 10PM up to 4 hours with an approved Noise Exemption Request. Saturday & Sunday: (between sunrise and 10PM); up to 4 hours with an approved Noise Exemption Request. There is a timeline of 3 weeks for noise exemption review. Bucket drives are the collection of money for donation taking place in outdoor spaces. Authorization for all donations are required by the Center for Campus Involvement/University Unions. Donations/Bucket Drives must be scheduled with the Center for Campus Involvement at least three working days prior to the activity to allow for proper scheduling. Permits are issued for no more than two consecutive days. Unless otherwise explicitly stated, a day shall be from 8:00 a.m. until 10:00 p.m. or dusk, whichever is earlier. Groups sponsoring donations must provide donors and potential donors with written information about the beneficiaries (through pamphlets, leaflets, signs, etc.). Only one donation per common area may occur at a time, and may not occur in the same areas and on the same day as a major program sponsored by another user. Only one donation per eligible user may be scheduled per day, per designated outdoor common area. Eligible users may schedule up to two days per month, per common area (for up to six total days per month). Donations must not interfere with normal University operations and may only occur in the public passageways. All money collected by recognized student organizations from donations must be handled in compliance with the requirements of the SOAS Office, via a University Fund Account. If needed, Central Student Government (CSG) can provide your organization with buckets for the day. Any other forms of fundraising or donation collection is not permitted on the Diag (can or clothing drives, etc.). All money collected by recognized student organizations must be deposited into the organization's SOAS accounts (no exceptions). For more information on donations, please visit the Student Organization Finances page on Donations. 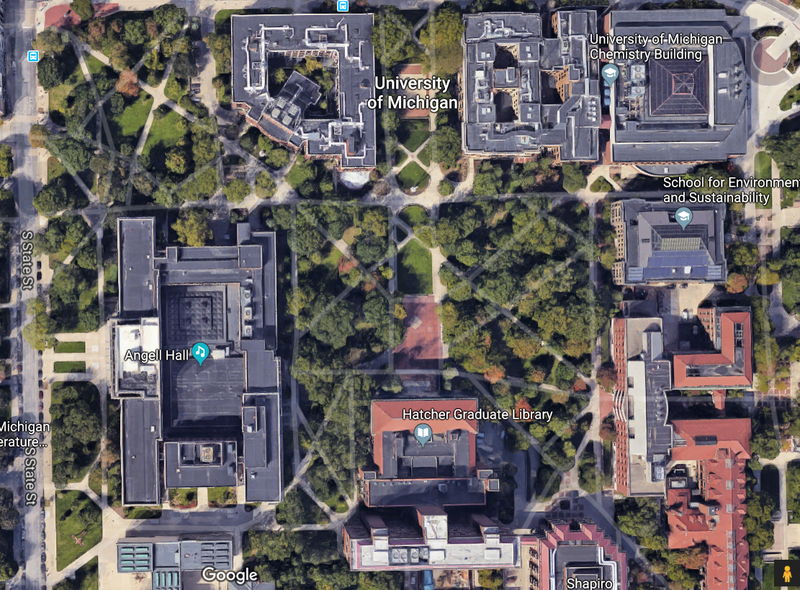 You can request the Diag or the Grove up to one year in advance. It takes time to coordinate use of the space. The more time you allow, the better. For simple requests, approval may be possible in only a few days. However, at certain times of the year, volume is such that we are not able to process requests immediately. But for noise exemptions, electricity, food, and other details, you must allow adequate time. All Large Event requests must be submitted at least 7 business days prior to the event date. For Large Events, you might wish to consider holding multiple dates. This helps if you don't know the availability of a performer, guest, etc. Dates can be held until 60 days prior. (Example: a request for April 30 can be held until March 2). The Diag is governed by the policy for Scheduled Use of the University of Michigan Outdoor Common Areas. It is your responsibility to understand the policy and follow all the guidelines. This information in no way takes precedence over the Diag policy. Please also be aware of the Student and Faculty Filming Guidelines and Requirements. Any user may seek to have specific parts of this policy waived for a specific purpose via the Diag Waiver Process. Waiver requests must be submitted 30 days in advance. The space of up to three 6-foot tables. In front of the concrete benches around the perimter of the Diag on the West, North, and East. If you want your Info Table to be in a specific location on the Diag, please mention this in your application. You are reserving the space only; CCI does not provide tables/chairs. The Diag Coordinator can refer you to several places where you can get tables and chairs. Space in middle of Diag, the brick space including the "M". Does not include the Info Table spaces around the periphery unless you specifically request those as well. Note: if you reserve the Large Event space but don't request the Info Table spaces, other events may be permitted during yours. Use of electricity or other requests from Facilities & Operations. Items being delivered to the Diag by outside companies (tents, tables, etc.). Large events typically end by 5PM. ​An event that starts at 5PM or later is a Night Event. Diag space is reserved by the day, not by the hour. Even if an event lasts only for an hour, it is the only instance of that event for that day. A Bucket Drive cannot be a standalone event; it must be supplemental to an existing event (Info Table, Large Event, or Night Event). Large Events and Night Events often have special set-up and operational needs, so the timeline for planning them is longer. If you have questions about the Diag Policy, please contact the Center for Campus Involvement at 763-5900 or email diag.info@umich.edu. For all outdoor, non-diag events, you must submit a different request to Facilities & Operations. Click here to visit their website.